Below are common attributes associated to Showy Evening Primrose. Become a care taker for Showy Evening Primrose! Below are member comments regarding how to plant Showy Evening Primrose. No comments have been posted regarding how to plant Showy Evening Primrose. Be the first! Do you know how to plant Showy Evening Primrose? Below are member comments regarding how to prune Showy Evening Primrose. No comments have been posted regarding how to prune Showy Evening Primrose. Be the first! Do you know how to prune Showy Evening Primrose? Below are member comments regarding how to fertilize Showy Evening Primrose. No comments have been posted regarding how to fertilize Showy Evening Primrose. Be the first! Do you know how to fertlize and water Showy Evening Primrose? Below are member comments regarding how to deal with Showy Evening Primrose's pests and problems. 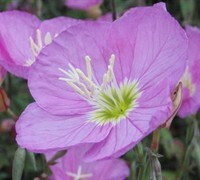 No comments have been posted regarding how to deal with Showy Evening Primrose's pests and problems. Be the first! Do you know how to deal with pests and problems with Showy Evening Primrose? Looking for Showy Evening Primrose? Showy Evening Primrose is a very enthusiastic wildflower that needs no feeding. Here in Zone 8a the predominate problem I have had is that the Showy Evening Primrose tends to happily reseed and spread to areas away from the original planting. If planted in really poor soil it seems to stay pretty well behaved but could very well become invasive in better soil. The Showy Evening Primrose is better known as Buttercups here in Mississippi. It is most often seen in large drifts along roadsides and can really put on a show especially in areas where nothing else seems to grow. I have been growing buttercups along the street side of my garden for a good number of years with many compliments.